Over the weekend, I took my friends and my sister to the Capsule Design Festival in Hayes Valley. The weather forecast said it would rain but it turned out to be okay. Citrusboy picked up lots of cool t-shirts from the same festival last year but had no luck this time around.. I liked her table the best at the festival because it was very simple and sweet, with a very unified look. She also had nice tea towels and fun, fabric lunch bags. I wish I could've gotten all the apples on display because each had a different pattern, and they look better as a group but alas, I have to watch my spendings. By the way, what should I put in the container? Hm..
You'll have to show me tomorrow. You should leave secret messages for Citrusboy to discover. Capsule was a whole lot of fun this time around. I'm not sure how I missed such a nifty find - go you! I'm so happy this lovely apple went to such a good home! Thanks for stopping by the booth and for your kind words. 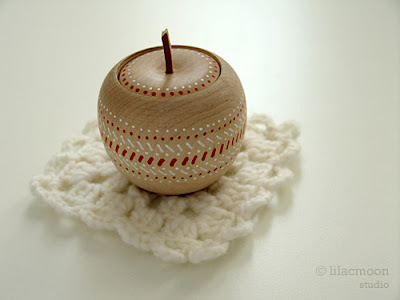 I'll be posting more apples (all different patterns) to my MissNatalie.etsy.com shop at the end of June.